I was eating tacos at a local joint and there was an item on the menu with quinoa. 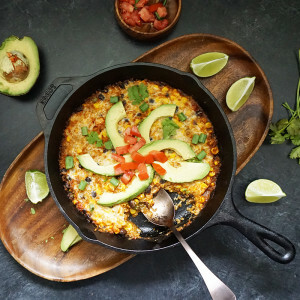 My dining partner didn’t think he’d tried it before until I reminded him of this quinoa enchilada skillet, some of which he definitely ate a few months back. In his defense, the quinoa in that is fairly hidden as a backdrop for all the enchilada sauce, corn, beans, cheese, and other deliciousness. This particular quinoa salad at the taco place was great and it made me think that another Southwest-inspired skillet was long overdue. 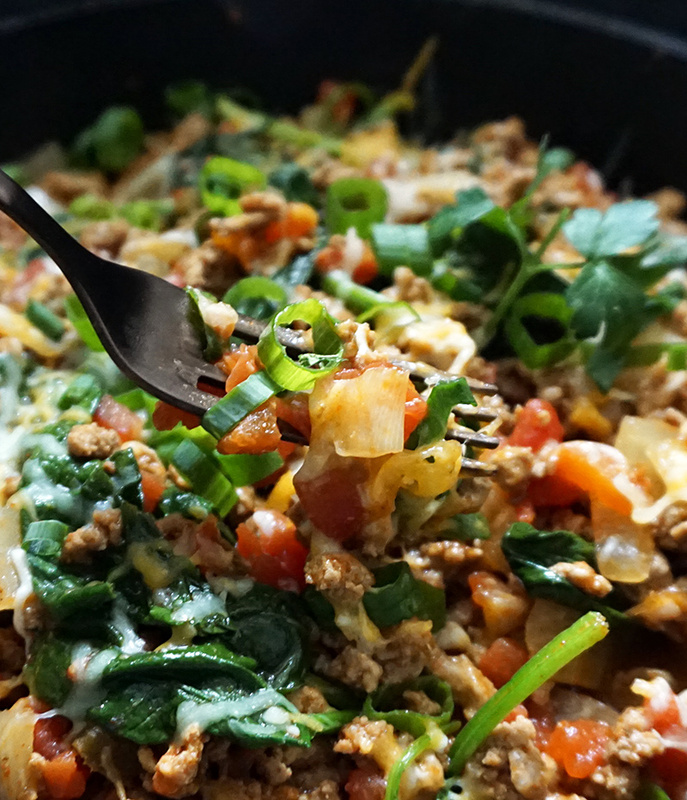 Enter this one pot easy cheesy turkey taco skillet. 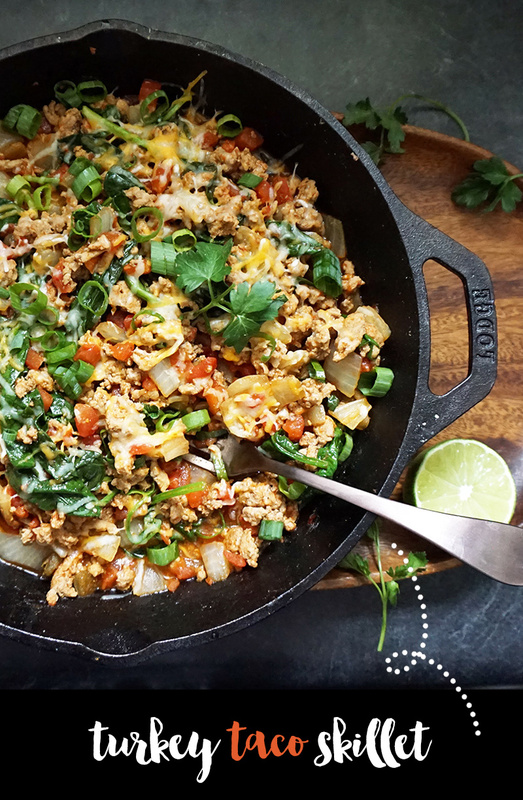 My goal with this turkey taco skillet was to keep it as healthy as possible, low carb, pile in as many veggies as I could (since they’ll be smooshed in alongside cheese and spices! ), and make it take just one skillet. 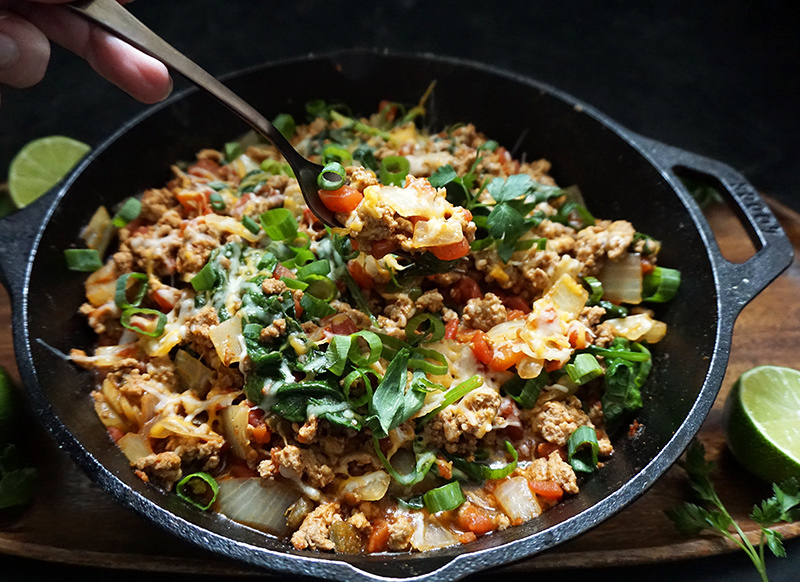 One pot dishes are rad for easy clean-up. I used my fave pre-seasoned Lodge 10-inch cast iron skillet. It heats up so hot and sizzly. Jonesing to buy this skillet! I used ground 93% lean ground turkey to keep the calories on the lower side, but feel free to substitute any kind of meat or meat-alternative you like. I’ve had great luck with Trader Joe’s Beef-less ground crumbles, which turn out quite beef-like, in my opinion. Or fry up some real beef, spicy sausage… whatever you like. 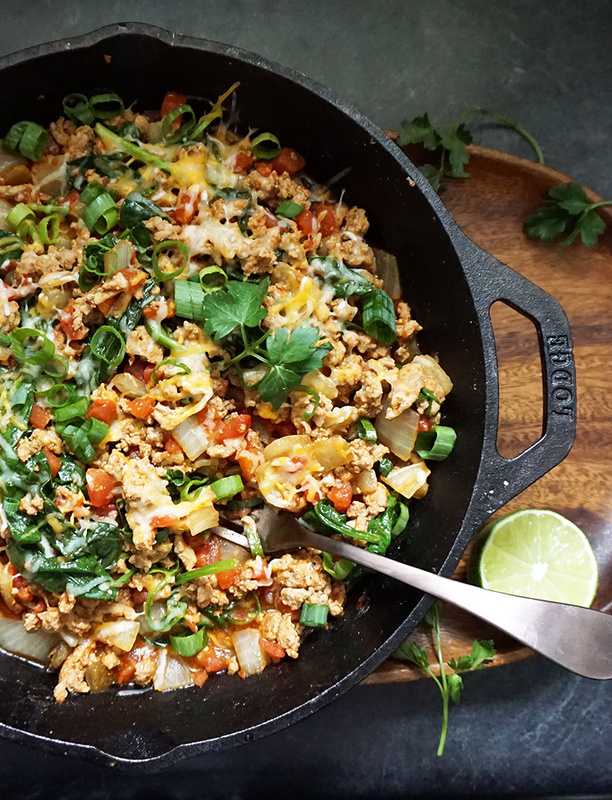 My secret favorite part of this taco skillet is the hidden greens. Like with a green smoothie, you can use a TON of high nutrition value greens and they wilt down to almost nothing in no time. It’s perfect for people like yours truly who sometimes want to hide greens in my food. Or for kids. 😉 I used three cups of spinach, but any greens mixture works: kale, arugula, spinach, romaine, etc. Animated assembly all in one pot! 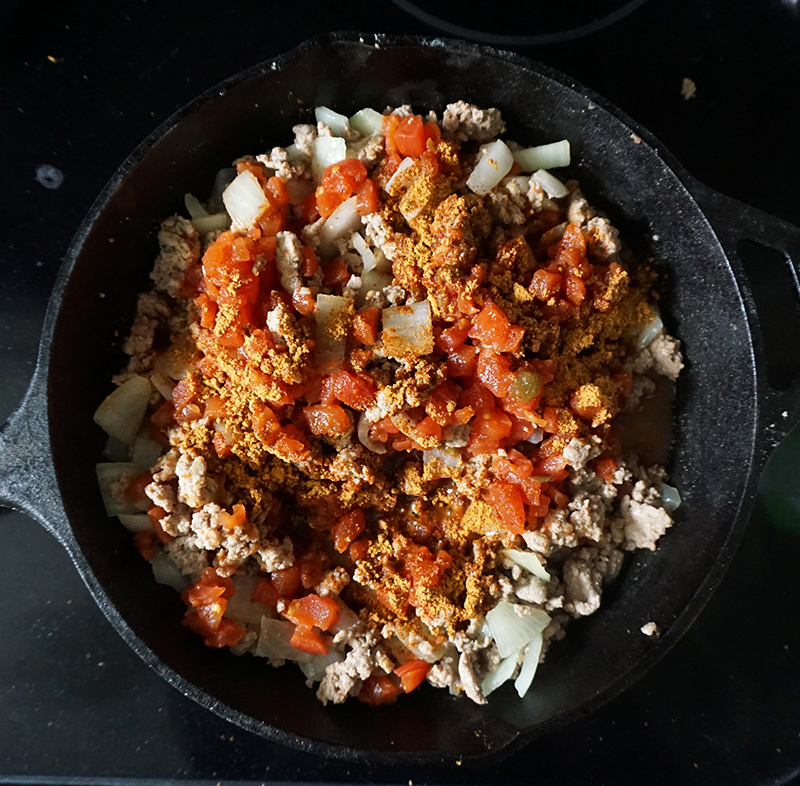 In a large pan with a small amount of oil, lightly brown ground turkey on medium heat, mixing often and breaking into small crumbles. Drain excess fat from the pan. Turn heat down to medium-low and add diced onions, and cook until onions start to get translucent, stirring often. Add tomatoes and taco seasoning and mix well. Add greens and let wilt as you stir them into the mixture. Cover mixture with shredded cheese until mostly melted. Garnish with chopped green onions and drizzle with lime juice. 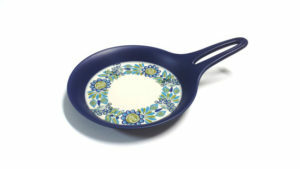 Serve hot on its own or with flat bread, in a burrito, or in flour or corn tortillas. Delicious!!! I made this recipe and added rice. We ate it on tortilla shells and added the spinach after. The kids and husband enjoyed! Definitely make it again! Yum!! I’m making that tomorrow for taco Tuesday! Love one pot meals! Definitely a heart dish perfect for the weather here in Australia right now, we’re in Autumn and its getting cold! Made this today, and a fairly fussy eating 5 year old is a big fan! 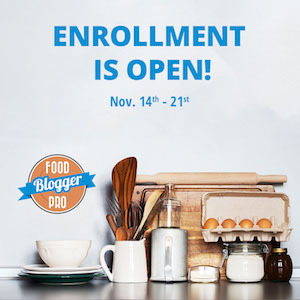 Healthy, tasty and simple cooking – thanks. Looks amazing! Do you think you could add some quinoa to it as well? Thanks! You absolutely could. It’s super flexible with pretty much any kind of grain. Just tried it. Added some red peppers to it and kale. Delight! Thanks! 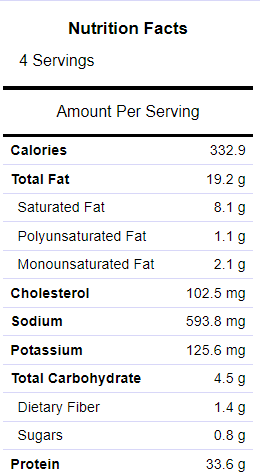 Hi, do you have the nutritional values for this recipe? How many calories does this have ? This was amazing! I sauteed a bit of diced garlic in with the onions and topped with some sliced avocado. So good. Will definitely make this again! Incredible. Great taste, texture and flavor. Will make again. Thanks for the recipe, Catherine. I’m so glad you liked it, Jeff! 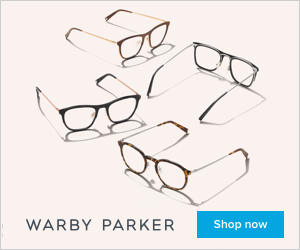 Can you share the nutritional values? Calories? Carbs? Made this for the first time today. So flavorful, easy to make, and can’t believe it’s that healthy! Definitely great for leftovers! 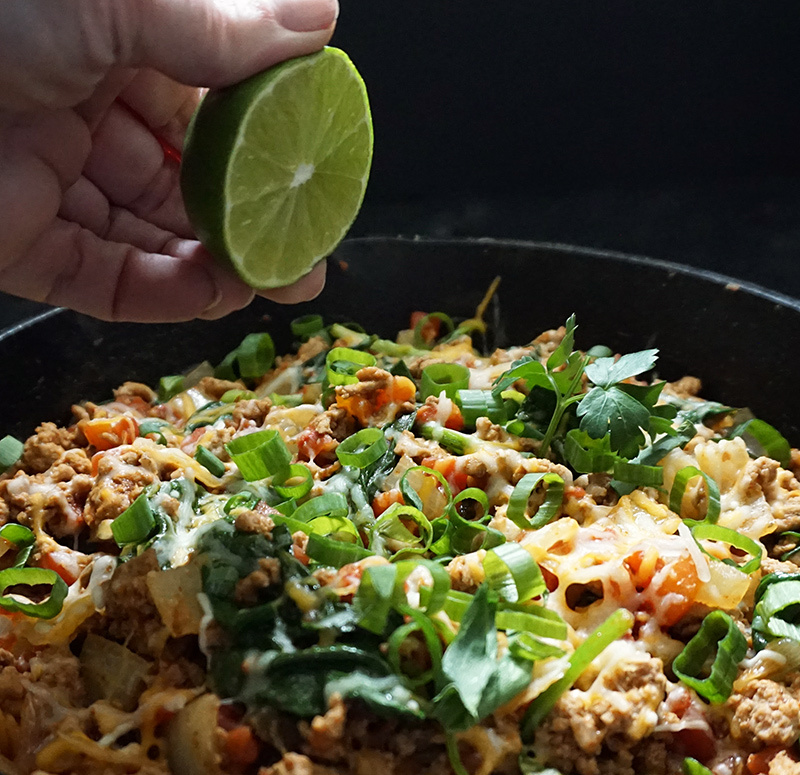 Added a little cilantro garnishment and that did the trick! This was FANTASTIC! I made it tonight, and my husband, who sometimes has a child-like aversion to vegetables, gobbled it right up! Thank you for this great recipe, I will definitely be making this again! It’s very sneaky with the veggies. So glad you both loved it!! This was so easy and so awesome! All 4 of us inhaled it…which is highly unusual in this house! Thank you! 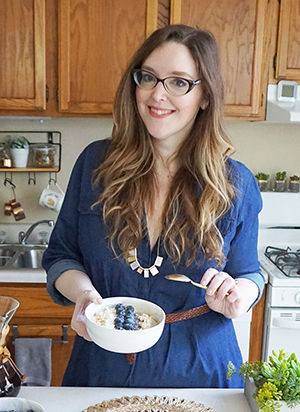 This recipe is my go-to! 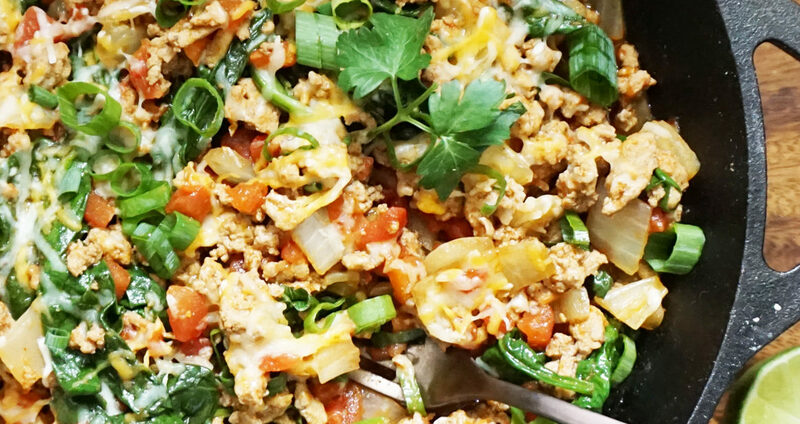 Low-carb, and packs in a ton of veggies without even being noticeable! 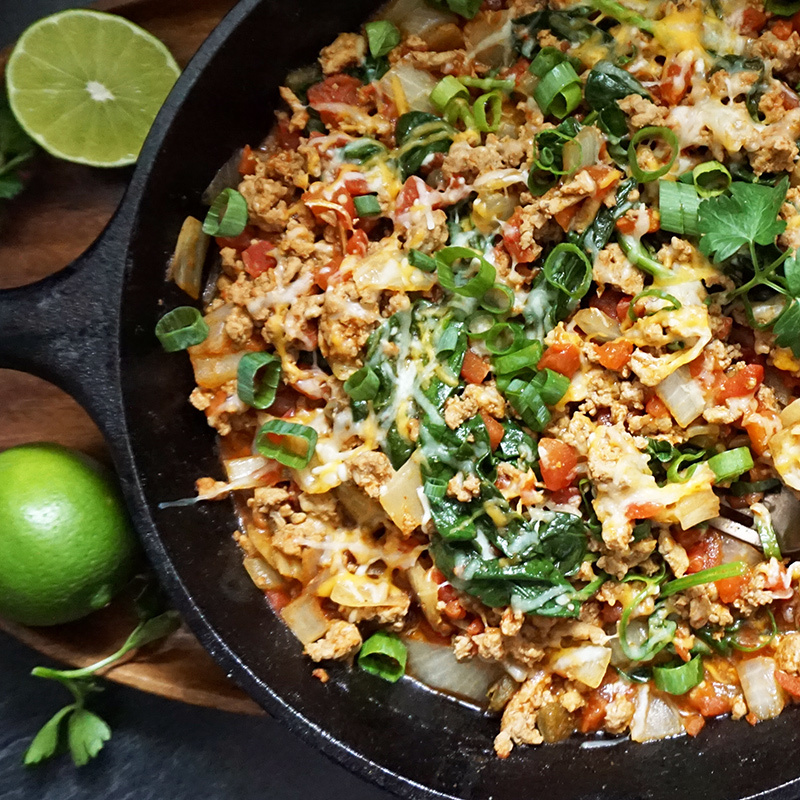 I’m a die-hard fan of Mexican food but have been looking for healthier options, and this recipe is perfect for that. Thank you! Made this for dinner tonight. Unfortunately I had to leave the spinach out because someone in my family saw green & said nope so, put it went. I had some mushrooms that needed attention so I they went. Served it as tacos & I loved the flavour. Will definitely make this again. HAs anyone used with spinach and frozen for meal preps? I sure have! This one is heavily in lunch rotation. I freeze it ahead of time in individual portions (almost always with spinach) and it holds up really well all week for lunch or dinner. Made this tonight and loved it!! 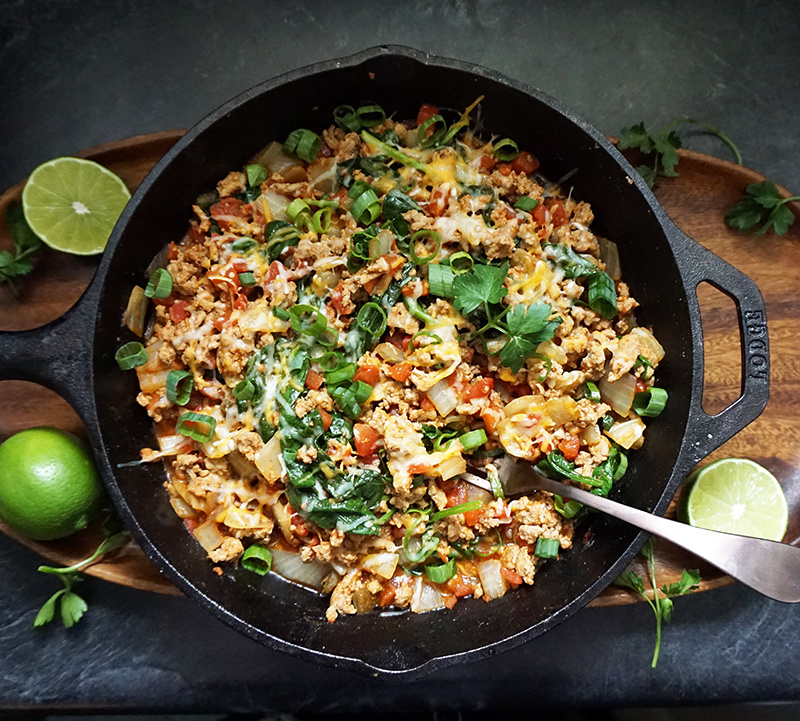 Delicious and a healthier version of tacos. Added more taco seasoning than called for and also added cheese once mixture in soft taco tortilla. Also added a bit of sour cream. Will definitely make again! !